Last night marked the premiere of Mike Birbiglia’s new one-man show, My Girlfriend’s Boyfriend, at Just For Laughs Toronto. Having seen his successful off-Broadway run of Sleepwalk With Me last year, this was unquestionably at the top of my list of “must-sees” for the Festival. And it remains there. It isn’t just an hour of standup with a title slapped on it — not to disparage the shows that are that, but the story arc is the key ingredient in making this show a substantial meal. The format of weaving a single story throughout, and jumping back through time for asides, is almost identical to that of Sleepwalk. It’s a winning formula for Birbiglia, who has a knack for steering the audience away from the main narrative for long stretches without anyone getting impatient. His courtship with his wife, Jenn,y is the cornerstone of the tale, which ties in awkward school dances, a missed flight, a hilariously graphic account of puking on an amusement park ride called the “Scrambler”, and the life-altering experience of making a girl laugh really hard for the first time. While the content itself isn’t as jaw-dropping as the climax of Sleepwalk (no jumping out of hotel room windows here), he makes his journey through his lifetime of romances just as riveting and hilarious. 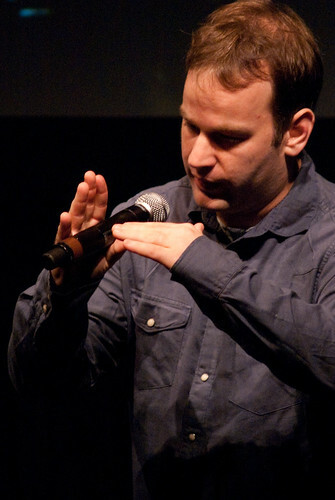 It feels as though this style of lengthy storytelling a perfect match for Birbiglia. Despite the minor lapses in judgment he recounts, his decency shines through, and he doesn’t need to convince us he’s the good guy in this story. My Girlfriend’s Boyfriend runs through Saturday at the Berkeley Street Theatre, and then heads to Just For Laughs Montreal July 15-17.